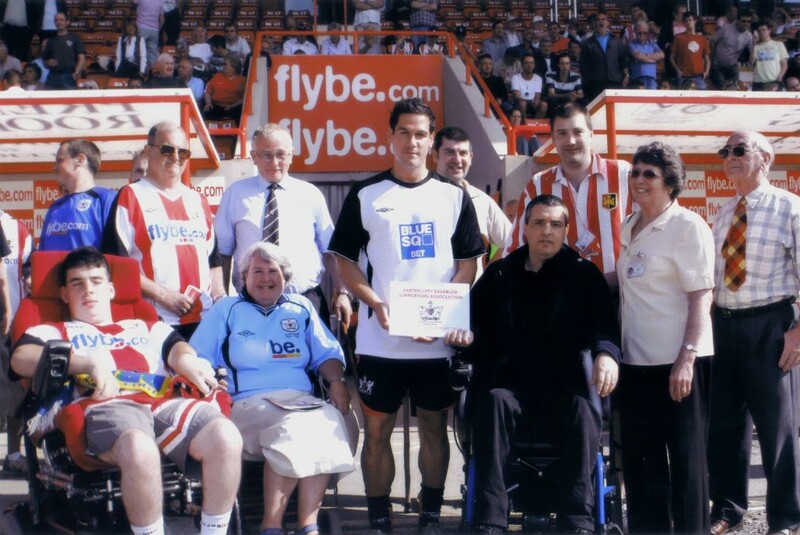 Exeter City Disabled Supporters Association was formed on 18th April, 2007 and officially launched on 27th August, 2007 at the Exeter City vs Weymouth Town match and we became the only DSA in the Blue Square Premier back in 2007. At our launch we also announced that Exeter City player Bertie Cozic had become our President and as so, we presented him with our first membership card as President. Our aims and objectives are the promotion of activities and schemes for the benefit of Exeter City AFC Ltd and its disabled supporters. We promote the inclusiveness of all supporters with disabilities and their personal assistant. The association shall also carry out such activities as the committee hereinafter mentioned shall from time to time determine. The association recognizes that all supporters with disabilities should have an equal opportunity to participate in an enjoyable match day experience and that people with disabilities and their personal assistant must have their interests recognized and promoted by Exeter City AFC Ltd with equal status to that of all other fans of the club. It’s not all serious though because we get together socially and enjoy ourselves in just the same way as you’d expect from other supporter groups. The first every committee was as follows: Nick Saunders (Chairman); Colin Atkins (Vice-Chairman); Alastair Young (Secretary); Margaret Atkins (Treasurer); Chris Fiddes; Mark Fisher; Paul Gray; Jeanne Jones; Ian Jubb; Les Knight and Dacre Holloway (ECFC Stadium Manager). To date we’ve raised over £21,000 and have donated over £11,000 towards many projects up at Exeter City Football Club for the benefit of those with disabilities, which has added better facilities for a better match day experience. Exeter City has many Supporter Groups that raise money for the football club and ‘rightly so’. However, we’re the only group raising funds to improve facilities for those with disabilities visiting Exeter City Football Club.